I've probably said this before, but I find all of these "edited together Japanese movie" ones just completely impenetrable. Time of the Apes is semi-coherent, but the two Fugitive Alien ones I have absolutely zero idea what is happening at any point. This episode has a special place in my heart because, for a long time—back when I didn't have cable and could only see the show when I visited my grandma's house—it was the only one I had on VHS, so I watched it much too often. By that time I had seen mayyybe three other episodes, not including Fugitive Alien I. And yes, it was surreal to finally witness the sequence of events that led to the forklift song. It's time, once again, for MST Club. 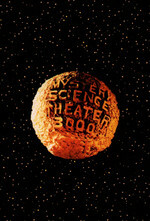 We watch videos and movies and Mystery Science Theater 3000 every Thursday night, starting at 7 PM Eastern, at https://cytu.be/r/Metafilter_MST3KClub, with the episode starting at 9. You should watch with us! Sanity points are best when spent with friends! They tried to kill him with a forklift!